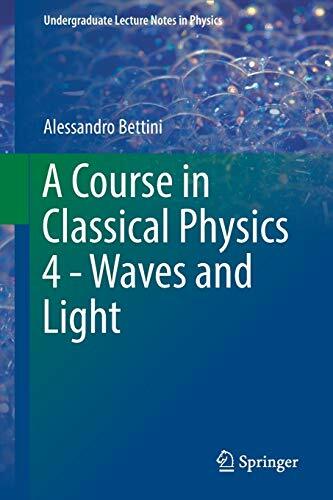 [PDF] A Course in Classical Physics 4 - Waves and Light (Undergraduate Lecture Notes in Physics) | Free eBooks Download - EBOOKEE! Posted on 2018-01-27, by luongquocchinh. Description: This fourth volume of a four-volume textbook covers the oscillations of systems with one or more degrees of freedom the concept of waves, focusing on light and sound phase and group velocities, their physical meaning, and their measurement diffraction and interference of light polarization phenomena and the formation of images in the eye and in optical instruments. The textbook as a whole covers electromagnetism, mechanics, fluids and thermodynamics, and waves and light, and is designed to reflect the typical syllabus during the first two years of a calculus-based university physics program. Throughout all four volumes, particular attention is paid to in-depth clarification of conceptual aspects, and to this end the historical roots of the principal concepts are traced. Emphasis is also consistently placed on the experimental basis of the concepts, highlighting the experimental nature of physics. Whenever feasible at the elementary level, concepts relevant to more advanced courses in quantum mechanics and atomic, solid state, nuclear, and particle physics are included. The textbook offers an ideal resource for physics students, lecturers and, last but not least, all those seeking a deeper understanding of the experimental basics of physics. No comments for "[PDF] A Course in Classical Physics 4 - Waves and Light (Undergraduate Lecture Notes in Physics)".